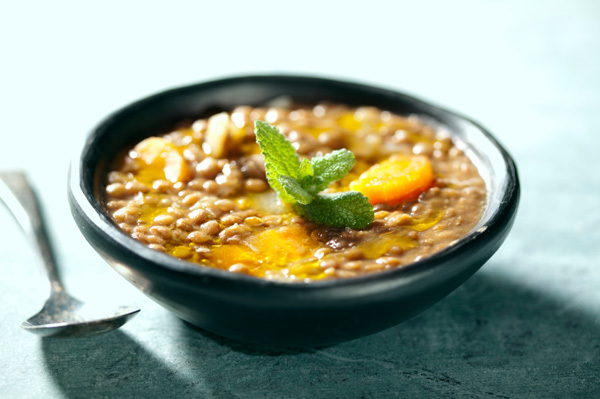 A delicious and healthy lentil soup! You'll need a large, heavy pot for cooking, and a colander, food processor, and large bowl for blending. Alternatively, an immersion blender can work well, and make your job a LOT easier. Heat oil in a large, heavy soup pot, add onions, garlic, carrots and cook over moderate heat until onions are limp. Pour in the broth and water, add the lentils and secret sauce and bring to a boil. Lower heat, cover, and simmer for 30 minutes, or until lentils are very soft. Stir in more warm water if soup becomes too thick. Pour soup through the colander, catching liquid that drains off in a large bowl, and then returning the liquid to the pot. Puree 1/3 of lentil mixture, and return to the pot. Stir in remaining whole-lentil mixture.